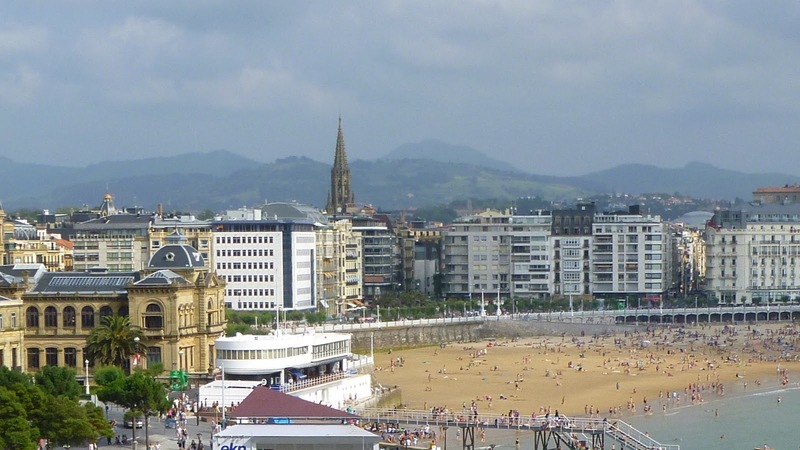 I went for a swim today at the Playa de la Concha in San Sebastián and thus accomplished, earlier than expected, my annual sea-swim ritual. It's a beautiful beach, right beside the old town. Some nice ladies took care of my bag while I dipped my carcass in the ocean and soaked it for half an hour. The water was a very pleasant temperature — I'd guess around 20°C. Lunch afterwards was an all seafood affair in a cheap-and-cheerful bar near the town hall: mussels in a vinaigrette, followed by squid with peppers, washed down with a couple of cañas. That was actually my second lunch as I'd had a huge mixed salad before my swim, accompanied by a large slice of tortilla and two glasses of white wine. No dinner tonight! Tomorrow I head for Zaragoza where the temperature is expected to be in the mid-30s. I'm slowly building up to the inferno of Andalucia in a few weeks' time.